Now you’ve picked a punnet of blackberries, what should you do with them? Here are our favourite ways to make the most of Britain’s best free crop. 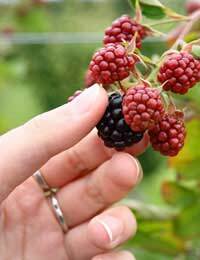 Blackberries are popular with almost everyone – if you’ve never been picking, you’re missing a treat. They grow freely all over the country, in hedges, along country lanes and in woodland parks. Take a tub with a lid – and a pair of gloves, in case of prickles – and bring home a punnet or two to use in our favourite recipes, below. This is a grown-up slushy – perfect for serving with spoons from a martini glass, or mixing with white rum to make a fruity iced cocktail. If you add the optional liqueur, the granita will have a softer set. Put the water and sugar in a saucepan and bring slowly to simmering point, swirling the pan gently to ensure the sugar dissolves evenly. Bubble for 2-3 minutes or until the liquid is slightly syrupy. Add the lemon juice and cool, then mix with the blackberries and optional liqueur. Put it all into a blender and whiz until smooth, then press the puree through a sieve to remove seeds. Taste it for sweetness – it might need a little extra sugar or lemon juice. Pour the puree into a freezerproof container and freeze. After two hours, remove the tub and stir the frozen outside bits into the middle, beating thoroughly. Return to the freezer for another hour and then repeat the stirring. Keep doing this until the mixture is freezing into crystals (about 3 hours). Serve in glasses. This traditional late-summer pudding is made with two seasonal favourites. If you’re lucky you might find some windfall apples and wild blackberries on the same walk! Prepare the apples first, putting them directly into your ovenproof crumble dish, and squeezing over enough lemon juice to cover (this prevents them from turning brown). Wash the blackberries and put them in with the apples, sprinkling with sugar and tossing gently to coat. Preheat the oven to 200°C and make the crumble. Put the butter, flour and salt into a large bowl and use a knife to cut the butter into smaller pieces. Then use your fingers to rub together until the mixture is the consistency of porridge oats. Stir in the Demerara sugar. Press the fruit into an even layer in the ovenproof dish, then sprinkle the crumble mixture evenly over the top. Don’t worry about bits poking through, larger lumps of butter, or pressing the mixture down – it should be loose so you get a nice crumbly texture at the end. Bake for 30-45 minutes, or until the crumble is golden on top. Leave it for 10 minutes at least before serving with custard or ice-cream.